Ten, Count Them, Ten! 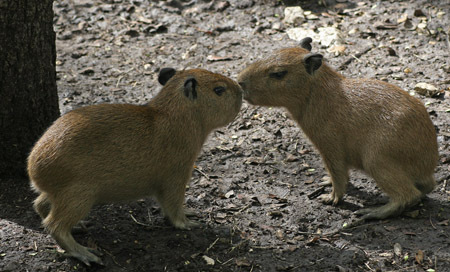 Baby Capybaras! 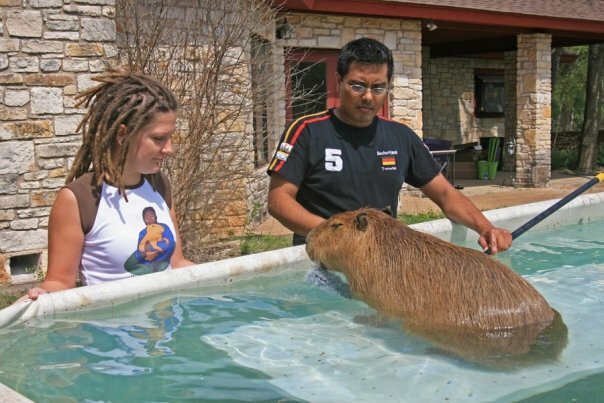 Last weekend I had the chance to visit a local capybara owner who had two capys give birth on the same day. The ten babies were just five days old when I visited and it’s hard to imagine anything cuter. I just have to share the photos with all of Caplin’s fans. 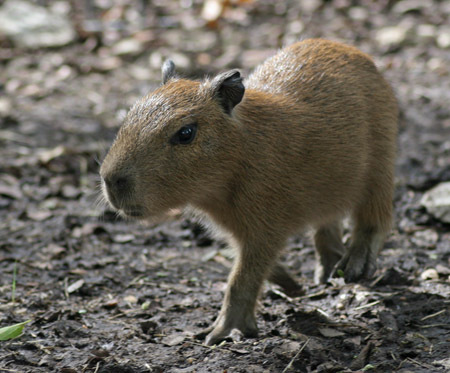 These babies will be offered for sale in a few weeks and, no, we are not getting a second capybara! If you contact me, I can send your email to their owner. 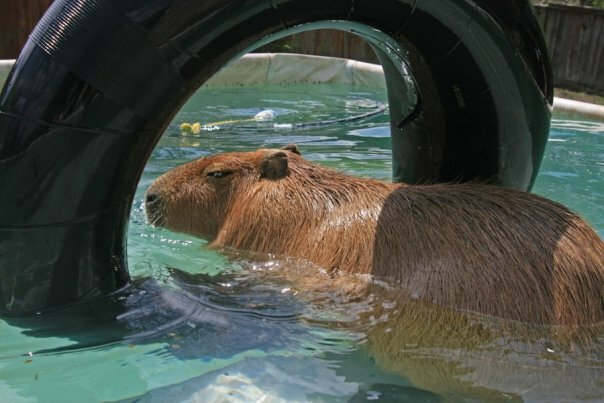 PLEASE read the FACute and the post on When Capybaras Bite before considering getting a pet capybara. 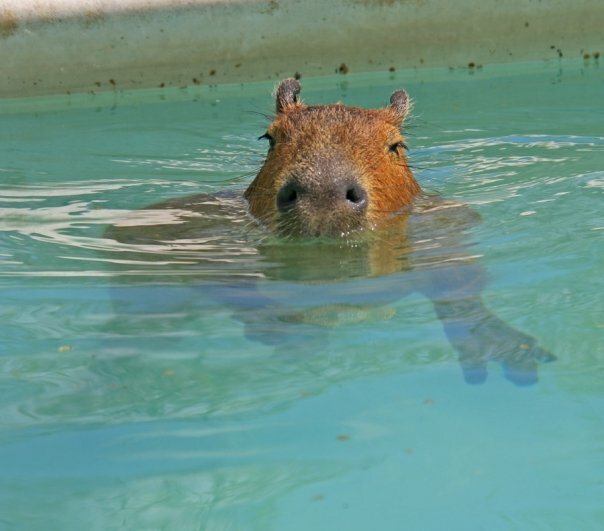 They are always incredibly cute but they are large animals and they do not have the tolerance of a dog or a cat. These guys were really eepy but the parents didn’t seem to get upset about it. I don’t know why Coral and Carl, who visited with me, felt they had to put food on its head. 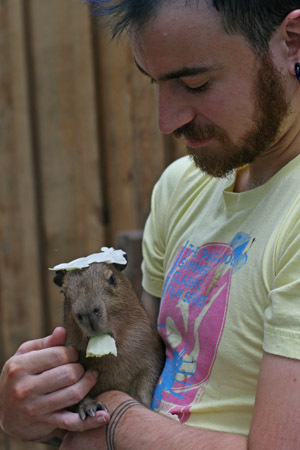 This may well have been this little capy’s first solid food. Wish I could post all my photos but this will have to do. 12 comments to Ten, Count Them, Ten! 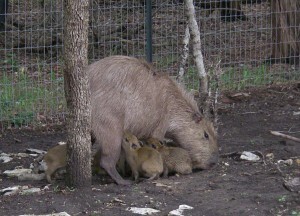 Baby Capybaras! The pain of cuteness! it slays! 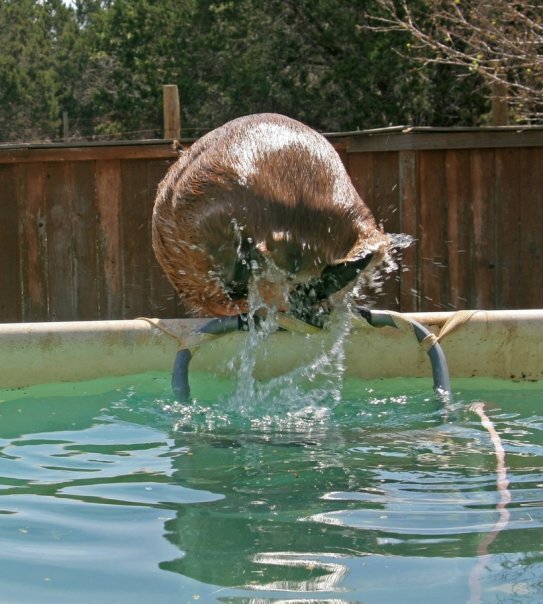 I so want to feel their soft little vertical lips and pet the smooth roundy butts! 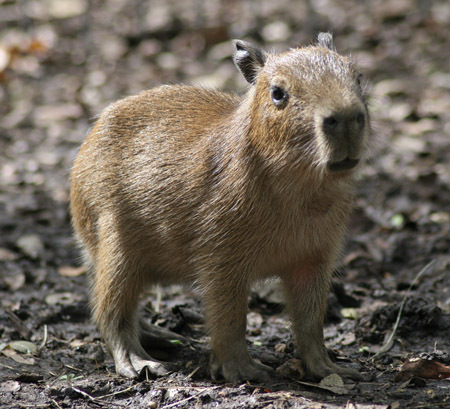 I have always loved Capys since I first saw them as a kid & instantly knew they were the big relatives of my beloved guinea pigs. 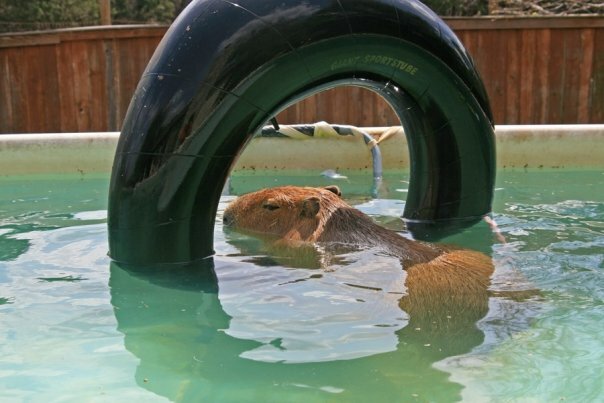 I live in Montreal, in an apartment, so I don’t think there’s a Capy in my immediate future. these little guys are too cute! 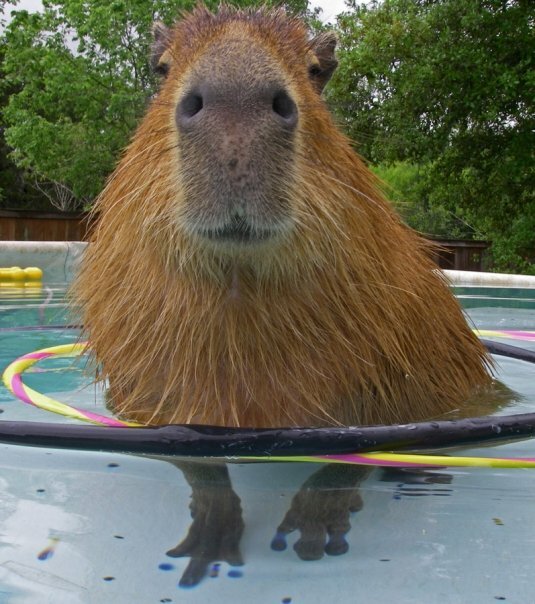 i have always loved capybaras since being a big fan of bill peet’s capybara-inspired creatures. Darn! When we bought our farm in SE Texas, Hubby said I could get a ‘bara. 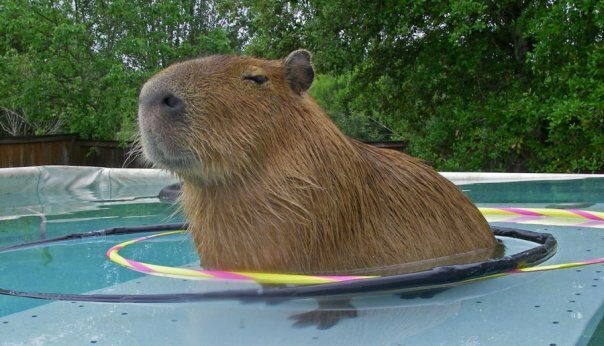 Wanted one since I read Capybobby at the age of 7. 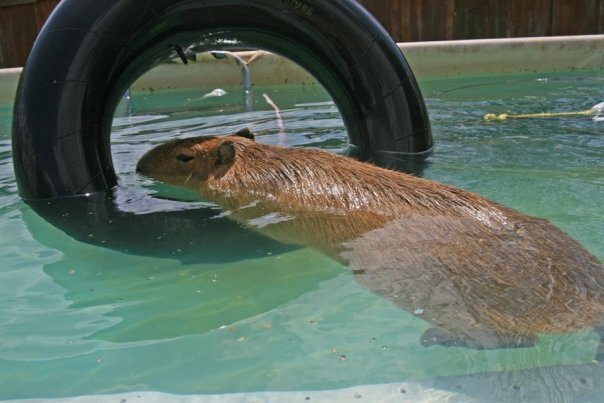 Relocated to plains of Colorado last year, and I just don’t think my current residence is compatible with my capybara dreams….sigh. Do you know how much they are selling the babies for? The FACute has links to where you can get babies. I believe they currently sell for about $600 each. are they for sale i alwys wanted one? They are probably gone by now. You can check the two breeders I suggest in the FACute. 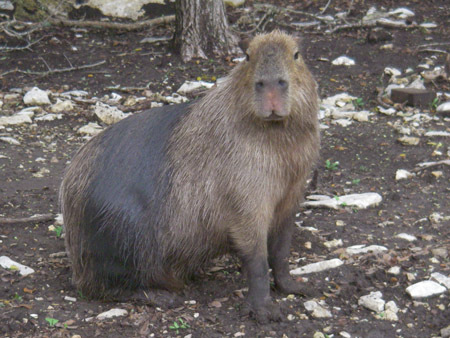 Hello, my name is amica and I’m just true g to find where to put inquires to buy a capybara do you have any for sale if so how much how old and where are you located?